Intro - gluas API - Dogwaffle API - GUI Server API - Misc. These functions interact directly with capabilities exposed by Project Dogwaffle, or are anyway specific to DogLua. Display a simple message box in the Dogwaffle main window. Every parameter passed (string, number, expression) will go an a different line. 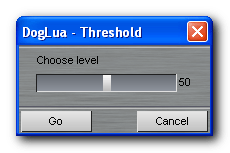 Create and display a simple dialog box, giving the user the ability to choose a value in a predefined range. If the user click on the cancel button, a value of -1 is returned. Update Dogwaffle display from the current working buffer, to reflect all modification made. A refresh is issued automatically when a Lua script execution end, but Dog_Refresh can be used to update the display whenever needed, for example during the execution of a long multipass script. Return the total number of frames present in the current animation, or 0 if working on a single frame. Return the current frame number, starting from 0. Move to the specified frame of the current animation. When a Dog_GotoFrame is issued, the current frame is refreshed from the working buffer; then the new frame become current, and the working buffer is updated with the new frame. Update the working buffer with the current frame. It's most useful for example after running another (external) plugin trough Dog_ShellExe, to make the buffer reflect the frames' modifications. Save an Undo point. It can be used to save a frame before doing some modifications, before asking the user to accept the changes and/or continue the work. This way the previous situation could be restored trough Dog_RestoreUndo(), if needed. N.B. What is saved is the current Dogwaffle frame/display, so if the script has done some modifications that need to be saved, a Dog_Refresh() have to called before using Dog_SaveUndo(). Restore a previously saved Undo point. Since that will alter the Dogwaffle frame/display, a Dog_GetBuffer() is then needed to updated the DogLua working buffer. Run the external command specified. It could be anything from a Dogwaffle plugin, any other executable, etc. Generally speaking, anything that could be executed from the Start - Run... Windows menu. The execution of the Lua script will be suspended until the executed command is terminated.